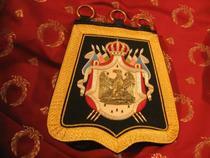 Used by light cavalry, this big "pocket" was not very useful to carry something. 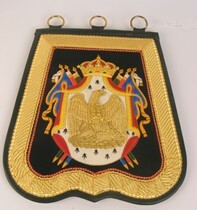 We can make any type of known sabretache, just ask for it and we can make it in about 3 months. 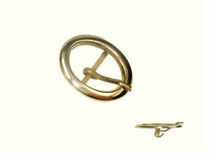 Some are on stock, in this case it is indicated. Copy of the sabretache of Lasalle, "général de brigade", during Stettin battle painted by Antoine Jean Gros, in "musée des Invalides" in Paris. Dark green melton. 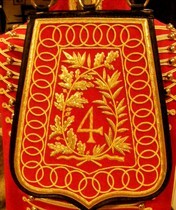 A sabretache of maréchal des logis of" chasseur à cheval de la garde" exists in musée de l'Empéri. 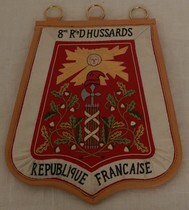 You can see it in book "Les trésors de l'Empéri", page 108. 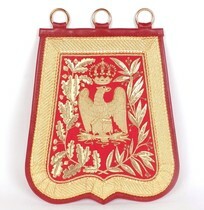 We just changed brass eagle for an embroidered one, especially nice. 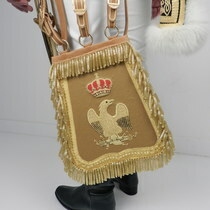 Braid is a soubise type, usually guard has always a "baton" type. 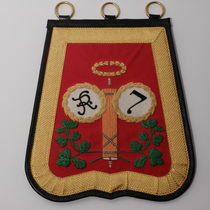 The colour used to recognize this regiment was...pink. Don't forget that a great part of population did not read or count, so colour was an easy way to identify regiments. 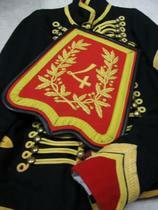 Captain Hirn, 10 th regiment of chasseur a cheval, sabretache. 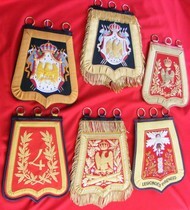 PICTURES OF THE ORIGINAL SABRETACHE KEPT IN A PRIVATE COLLECTION, CAN BE RECOGNIZED BY OXIDIZED COLOURS. BRIGHT COLOURS MAKE DIFFERENCE WITH OUR ACTUAL PRODUCTION. 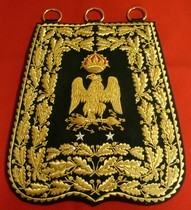 Copy from a sabretache belonging to Eugene De Beauharnais, son of Josephine. 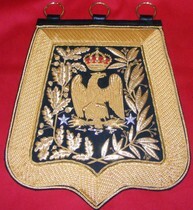 Officer chasseur à cheval de la garde, sabretache with embroidered eagle. 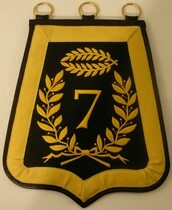 Rifle green melton, Golden braid. 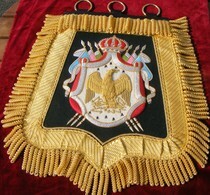 Embroidered centre including the imperial eagle . 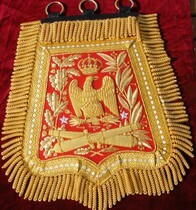 Different types of this sabretache existed, some xwith brass eagles, some with embroidered eagles. 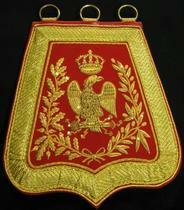 Normally embroidered eagles were used at the beginning of Empire and brass later, but an embroidered sabretache have been found on Waterloo battlefield! 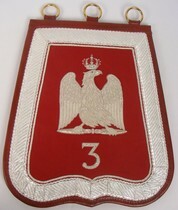 Note R and F letter of words French and République, and number of regiment in 2 laurel crowns. Note "Q" letter of word république with his very particular drawing. Sur un modèle conservé au musée de l'Empéri, cuir brun, la faute d'orthographe est bien conforme au modèle d'origine....ce qui compte c'est la foi républicaine. 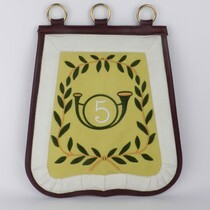 Classical type, number 5 signs 5th regiment of hussar. Indicated price is without belt. 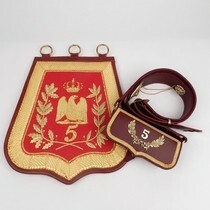 We used a chiseled shield on strap and an old laurel crown...We had just one of each. No other will be produced again as it is. 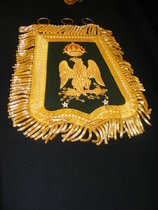 Gold embroideries on dark green melton. Copied on those of Empéri described page 139 of book" LES TRÉSORS DE L'EMPERI", really must habe book sold in our documentation. We made it with his original colours as they were before time has passed. 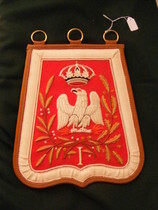 We replaced the eagle from "100 jours" by the original embroideries. 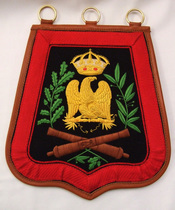 "Officier superieur de cavalerie legere", sabretache. 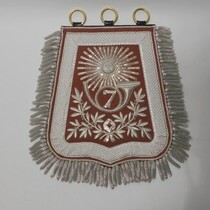 Very similar to a sabretache for general, but with or without stars and number. 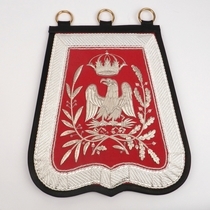 Sabretache usually attributed for light cavlry officers, any number can be added under the eagle . 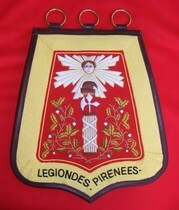 Described in "SOLDATS NAPOLÉONIENS" Nr 15 of septembre 2007, pages 24 to 29. 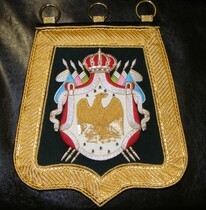 Rare type with his original brown colour and a nice embroidered eagle. 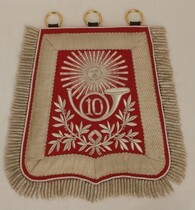 Extremely original type of sabretache pictured in revue tradition . Brown leather was prefered to black at the beginning of Empire. Usual laurel and oak leaves on borders. Copy from an original sabretache of Musée de L'Emperi. 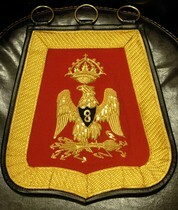 Normal colour of braid and buttons is silver for 8 th hussar...except for a "major". 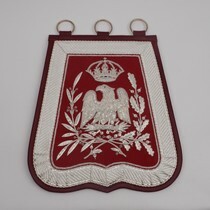 From an original sabretache in musée de l'Empéri. 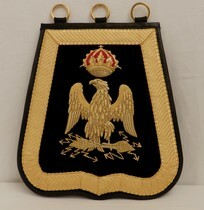 Unusual black velvet for this sabretache, chosen by Berthier to distinguish his officers from all other staff officers. 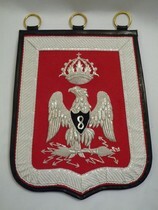 Eagle embroideries are especially nice. 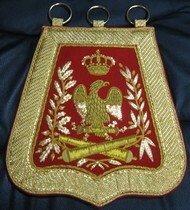 Can be seen in pages 184 and 185 of the book: "Les Trésors de l'Empéri"
Brass. 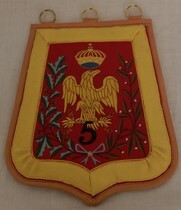 55 X 32 mm. 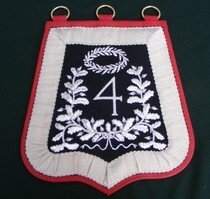 Silk embroideries on dark green melton. 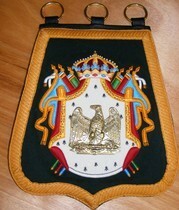 Brass eagle. 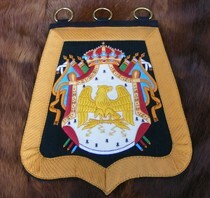 Chasseur a cheval de la garde had to protect the Emperor, they accompanied him in all travels.